Lead Story: As the teacher strike grows smaller in the rearview mirror, Mayor Rahm Emanuel’s attention now turns to negotiations with unions representing the city’s fire, police and transit departments. Of course, none of those three unions are allowed to strike as they provide public services. But after the recent teachers strike, those groups sense blood in the water around Emanuel. And the mayor isn’t standing pat, launching a media blitz that touts the mayor’s reform agenda and the gains to be had from the negotiations with the teachers union. Seeing as how smoothly the negotiations with the teachers union went, I can’t wait to see how Scott Walker Mayor Emanuel handles this round. And then: Christopher Vaughn, the man accused of killing his wife and three children on a road trip in 2007, was found guilty of all four murders Thursday. The jury deliberated for less than an hour. After the verdict, Will County States Attorney James Glasgow told reporters, “This case is not just a murder, it&apos;s an atrocity. To annihilate your family, I can&apos;t think of a more unspeakable crime.” As I pointed out yesterday, this is indeed another reason why the case hasn&apos;t drawn the kind of media coverage other cases have. There was no breathless breaking news report on television to announce the verdict or tall headlines to grab attention. But maybe that&apos;s for the best; justice has now been served and the family can now grieve in peace. RIP: Cecil Gordon, NASCAR driver and owner, at the age of 71. While Gordon had a modest amount of success in his career as a driver, including 111 top 10 finishes, he never won a single race out of 449 total races in his 17-year driving career from 1968 to 1985. A man in Austin, Tex., tried to be clever in his anti-Obama racism and hung an empty chair from a tree, an oh-so-clever reference to Clint Eastwood’s Invisible Obama. And to lynchings. Speaking of the charged election, FiveThirtyEight’s Nate Silver delves into the weird science behind polls, using Wednesday’s poll numbers as an example. Fiona Apple joins Snoop Dogg (or Snoop Lion, whatever) and Willie Nelson the latest musician nabbed for possession of drugs at the Texas border stop of Sierra Blanca. The Mars Curiosity rover is about to examine its first specific target: a pyramid-shaped rock of unknown origin. “99 Problems,” Mitt Romney edition. Chicago Inspector General Joe Ferguson has claimed that the Chicago Police Department has grossly mismanaged its evidence department. For the third straight month, unemployment in Illinois rose, up to 9.1 percent in August. 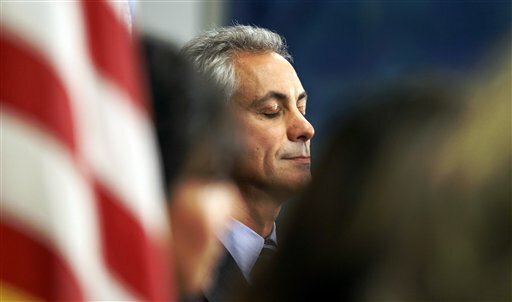 Because he doesn&apos;t already have enough to negotiate, Mayor Emanuel is now lending a hand in talks with Israel. The Reader takes a look at the long, strange world journey of wastepaper. Gov. Quinn is heading to Brazil to allegedly boost tourism because if there’s anywhere the people who live on the beaches of Brazil want to go, it’s Chicago in February. Sox Watch: The Sox fell to Kansas City last night, missing a chance to increase their lead over the Tigers, who lost earlier in the day. The Pale Hose are still up by two games in the AL Central. While the Bears would like to act like there’s no rift because of Jay Cutler’s behavior, the fact that teammates are having to defend him isn’t a good sign. Cubs manager Dale Sveum can’t even muster anger at his players for their sloppy play. The Washington Nationals and Cincinnati Reds became the first MLB teams to clinch playoff spots. Those awful replacement refs don’t seem to be hurting the NFL’s TV ratings.